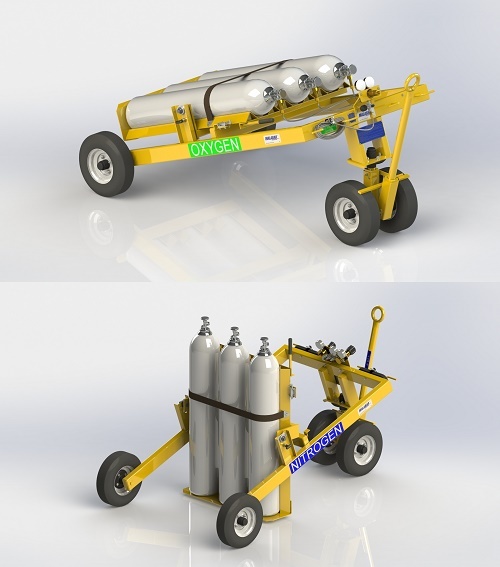 Aero Express is the only US Authorized Distributor for the Malabar Model 8932 3 Bottle Gas Delivery Cart. Model 8932 O2 / N2 Service Cart is designed with a counter balanced bottle rack making loading and unloading bottles a one person task. It securely mounts the bottles as well as the hoses and fittings required for servicing aircraft. The low profile and low center of gravity trailer can be built to service either oxygen or nitrogen systems. The N2 cart includes dual regulators for high pressure nitrogen servicing of struts an accumulator systems and low pressure nitrogen servicing of tires and operating aircraft jacks through dual service hoses with service fittings. The O2 cart services aircraft oxygen systems.